Senator Flanagan says “we don’t need any new legislation” for East Ramapo. As Senate Majority leader, he is blocking legislation that passed the NY State Assembly, and that Governor Cuomo has said he would sign. This legislation is a compromise bill, which instead of removing the board and taking over the district would simply speed up the process of oversight by the State Education Department. Senator Flanagan thinks the history of failure to hold the East Ramapo school board accountable is proof that they don’t need more oversight. I think he is wrong, and I hope he will change his mind. The East Ramapo school board tried to use the Individuals with Disabilities in Education Act (IDEA) as an excuse to use public funds to pay tuition in private religious schools. The NY State Dept. of Education (NYSED) found this was a violation of federal and New York state laws and regulations. The NYSED findings were upheld by the New York State Supreme Court and the NY Court of Appeals. Since the excuse of following the IDEA was invalid, transferring taxpayer funds to private religious schools was a violation of the fiduciary responsibility of the board. It took NYSED five years and two lawsuits to stop the practice. About the IDEA: Before of the IDEA, too often children with special needs were segregated and warehoused. The IDEA says children with disabilities must have an opportunity to be educated along with the rest of the children, in the “least restrictive environment”. If a school district is unable to accommodate a disability in a public school, then they must pay for that student to receive an education in a facility that does. The school board also established a segregated environment within the public schools themselves. The district used “Yiddish language” as an excuse. Whole wings and floors of buildings were set aside and apart, with different teachers, different schedules, even a different janitor. The NAACP filed a complaint to the Federal Education Department’s Office of Civil Rights. Once again, years went by before the district’s practices were found to be outside of the law. The district has now agreed to a plan, but whether and to what extent they will comply has yet to be seen. The veto is not an extra power of the state, just a way for it to exercise it’s power in real time, before damage is done. Altogether, there have been almost 10 years of delays in correcting district actions. These actions have cost the district millions of dollars and have contributed to cuts in programs and a decline in the quality of education. Had there been a monitor with veto power, obviously illegal practices would never have happened. The board has engaged in a practice of real estate decisions which have benefited private religious schools and harmed public education. In 2008, a reorganization review process was flawed by incomplete collection of data on population and housing. The Mayor of the Village of Spring Valley appeared at hearings and testified that a $1 billion urban renewal project was currently underway, and that new housing starts would mean many more new enrollments in the district. He was ignored, and the district’s projections were low by 14%. Instead of declining, enrollment increased by over 1000 students. The board used the flawed study as an excuse to close and then sell two school buildings. The sales of the buildings continued even after the enrollment increased. In July 2010 Hillcrest school was sold for $3.1 million to Yeshiva Avir Yaakov (YAY). An appraisal of $5.9 million had been obtained before receiving bids. A second appraisal for $3.2 million, by Avi Vardi of Appraisal Group International, was done after the bids were opened. Community activists discovered that the second appraisal was a fraud. It misrepresented a “comparable sale” of a school which, in fact, never occurred. That sale was listed as “Comparable Sale #2” of a school building sold for $1.9 million, however, records from the Town of Ramapo indicate “land only”. The property document indicate that it is a parking lot. An investigation by the NY State Atty. General revealed that someone associated with YAY arranged for Vardi’s services in preparing the appraisal. Then, on July 16, 2010, a member of the East Ramapo Board emailed Vardi’s private cell number and other contact information to the Board’s attorney. Later that afternoon, that attorney hired Vardi to furnish his appraisal of the Hillcrest School to the District in time for a July 28, 2010, Board meeting. The appraiser was found guilty of filing a false instrument. The Atty. General was unable to pursue the investigation into the role of the school board in obtaining the fraudulent appraisal because the school board sued the AG to prevent release of 1300 documents, claiming attorney-client confidentiality. The case is still open. The Commissioner of Education annulled the sale. However, the board leased the building to YAY. Commissioner King then annulled the lease. The board then sued the Commissioner, but lost. YAY occupied the building the entire time. An independent valuation of the property concluded it was worth $11.32 million. Its final sale price was $4.85 million. While the Atty. General was still conducting an investigation of the previous sale, and while the financial monitor, Hank Greenberg, was conducting his investigation, they sold the school again to YAY. The school board continues to claim that because it has gotten away with all of the above, that is proof that a monitor with veto power is not warranted. Senator Flanagan (so far) agrees with them. I believe that any reasonable, unbiased individual with full access to the facts will come to the opposite conclusion. It is exactly because the school board has been so successful in gaming the system that the appointment of a monitor with veto power is necessary. PS: Strong East Ramapo is inviting you to accompany them to Albany on Wednesday January 13. I strongly support them and I hope to see YOU there! PPS: Advocates for Justice is a public interest, not-for=profit law firm that has taken action on behalf of the children of East Ramapo in Federal Court. They are trying to raise $25,000 before the end of the year, and have almost reached that goal! Please give generously! Donations ARE tax deductible! Earlier this year we rallied and lobbied in Albany for a bill which would have provided a monitor with veto power for East Ramapo. Our efforts were successful in getting the bill passed by the Assembly, but it was blocked from even being considered by the leader of the Senate. Albany has a two year cycle for bills, which means the bill could still become law in 2016. We will again do everything in our power to make this happen. Not because it is the answer to all of the problems, but because it is the best first step we have at our disposal at this point in time. 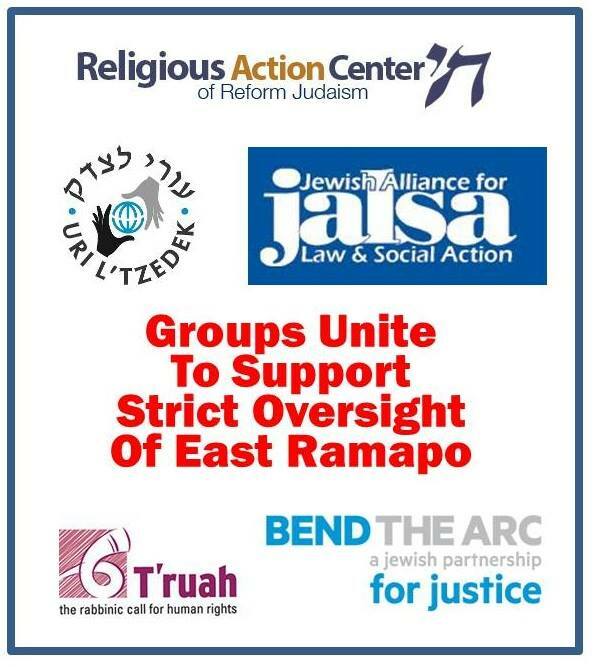 The bill has new support, including the monitors who have been studying the district, The Rockland County Democratic Committee, a new editorial by the Journal News, and several Jewish organizations. We are being told that it is possible that the bill will pass, and that the one thing most needed for it to pass is public pressure. From you! In the last Power of Ten Update, I asked you to contact Rockland County Legislators and urge them not to vote to re-approve Aron Wieder as Majority Leader. Apparently, your voice was heard, and he has withdrawn from the position. Thank you to everyone who participated! Many parents and students have expressed their appreciation for the breath of fresh air that Dr. Wortham has brought to our district. Some are already calling for her to remain. The school board has begun the process of deciding who will be the superintendent next year and going forward. They have posted a letter about the selection process, which includes some opportunities for input from the public. A new investigative report by News 12 reporter Tara Rosenblum has revealed that fire safety is still a problem in many East Ramapo yeshivas. You may remember back on October 15 Power of Ten reported that a Spring Valley Fire Captain said many schools were unsafe. Tara Rosenblum deserves credit for doing investigative reporting that may save lives, rather than waiting for the disaster to make the news. If there is one person who is most responsible for the degradation of East Ramapo, it is Aron Wieder. In Nov, 2009, Aron Wieder brought Al D’Agostino to East Ramapo. In June of 2011, the school board majority, led by Aron Wieder chose Dr. Joel Klein for Superintendent of schools. Last year, the majority of the Democrats in the Rockland County Legislature supported the oversight bill offered by Assembly members Jaffee and Zebrowski and Senator Carlucci. Mr. Wieder, as the leader of the Democratic majority, should have carried their message to Albany. Instead, he spearheaded the effort to block the legislation. The Rockland County Legislature Democrats should not allow Mr. Wieder to continue in a leadership role. His record as Majority Leader is inconsistent with Democratic Party values. He put his own opinions ahead of his duty to his fellow legislators. There are three Democratic Rockland County Legislators who supported the legislation for a monitor in East Ramapo but have not yet indicated if they will oppose a re-nomination of Mr. Wieder. They are Toney Earl, Aney Paul, and Alden Wolfe. Please call the Legislature at 845-638-5100 and ask to speak to Toney Earl, Aney Paul, and Alden Wolfe. You may be directed to their constituent representatives. Thank you for continuing to support strong oversight for East Ramapo. I am calling to ask you not to vote to approve Aron Wieder as Majority Leader. Mr. Wieder does not support strong oversight for East Ramapo. He does not respect our views and he has failed to represent you as your leader. Thousands of children attending area yeshivas are not receiving adequate education. Now, several graduates and parents are seeking the assistance of the court system in ensuring that all children are educated. This action parallels demands for education in New York City and around the world. Indeed, the winners of the Nobel Peace Prize in 2014 were education activists. In Pakistan, Malala was shot for trying to go to school. Thurgood Marshall faced a lynch mob as he fought against laws which prevented African-Americans from receiving an equal education. Education advocates in East Ramapo are not facing the same tactics that Malala faces or that Thurgood Marshall faced, but yeshiva families who speak out risk being shunned, punished financially, verbally abused and even physically assaulted. Education cannot only be for some. According to the Supreme Court, it must be for all. However, in East Ramapo, a political deal was made between the school district administrators and the yeshivas: The district would remain indifferent to the lack of education in yeshivas, and in return school budgets would not be opposed. 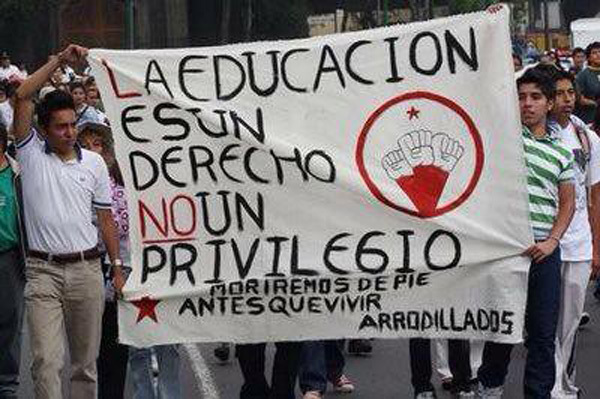 The result has been destruction of education for all. Advocates for Justice is bringing lawsuits of behalf of both public school and yeshiva children. They need your support at this time. Will you please help? The new Superintendent is making friends everywhere with her cheerful attitude. Students have been feeling depressed about all the cuts. Dr. Wortham has made a good effort to increase school spirit. This is not a replacement for restoring programs, but it is a good beginning. For more information about Dr. Wortham see her interview on HNE Network TV. It is not expected that the board will challenge Dr. Wortham the way they did Dr. Oustacher, with demands to absorb religious schools, create segregated classes, close and sell schools, hire unnecessary or unqualified personnel, file lawsuits against the State Ed Dept. and the Atty. General, etc. As long as the threat of a monitor with veto power is hanging over their heads, they will probably continue to avoid controversy. Hopefully Dr. Wortham will use the opportunity to make improvements. 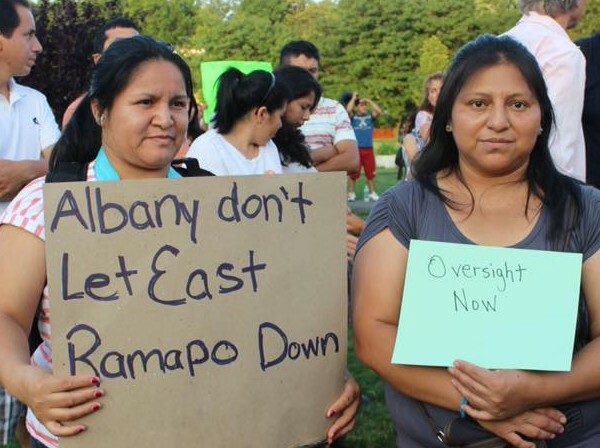 Please join Strong East Ramapo in their call for Dennis Walcott’s report to include strong language calling for a state monitor with veto power that would restore a sense of confidence in the future of East Ramapo. Mr. Walcott’s report is due December 15, so raise your voice today.